I've seen advertisement for the past few weeks about Pepsi Max & their "Field of Dreams" - where you can vote for your favorite baseball players. 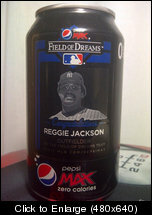 I personally never seen any cans, but while check out eBay (I like to window shop for thing my wife won't let me buy) - I seen a Pepsi Max Field of Dreams can for Rod Carew. Has anyone seen this? Are there going to be more for more players? Are they only going to be available in limited areas? Anyone know anything more? I did a few searches and haven't found nothing.